At the end of his two terms in office, Ronald Reagan viewed with satisfaction the achievements of his program known as the Reagan Revolution, which aimed to reinvigorate the American people and reducetheir reliance upon Government. He felt he had fulfilled his campaign pledge of 1980 to restore "the great, confident roar of American progress and growth and optimism." In foreign policy, Reagan sought to achieve "peace through strength." He increased defense spending and improved relations with Soviet Union. 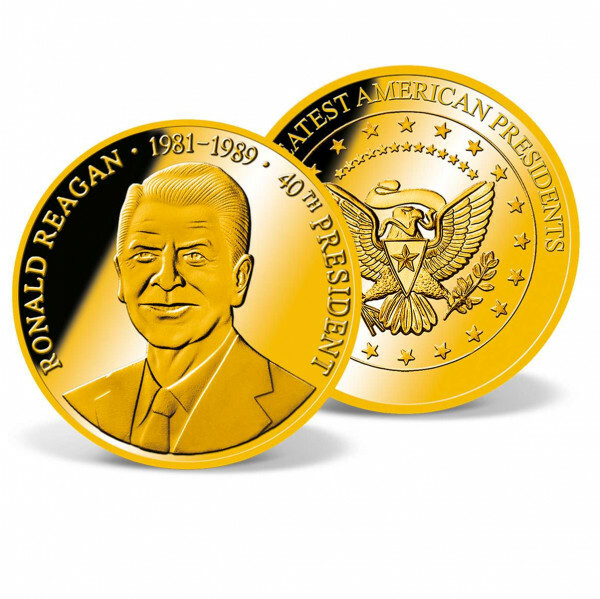 Meticulously designed, this dazzling tribute to the 40th President of the United States features a highly detailed engraving of Ronald Reagan on the obverse and is minted in a limitation of only 9,999 complete collections worldwide. This 24k gold-layered coin is minted to the highestquality "Proof  standard and comes in its own protective capsule to preserve it for generations to come - a true collector's item.